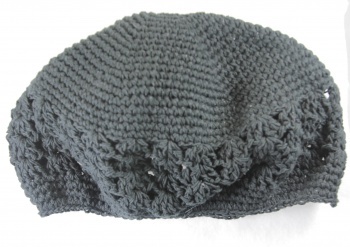 This is a Black Cotton Crochet Beanie that will match any outfit. It has a nice thick feel and can fit a baby's head to about an 8 year old. Wear it by itself or add any color flower or bow to give it an added touch. It has nice size crochet openings in the middle of the hat, which you can just slide the flower through. It is about 8.5" across and 6.25" high.